Certified English translations of personal documents written in another language are generally required in the US for immigration purposes and for other important processes required by government institutions or agencies. If you are in such situation and need a certified translation of your pertinent documents urgently, don’t worry because USA Translate is here to help you out. Our certified translation services are backed by our experience of more than 16 years and by our membership at the American Translators Association and we can do them accurately, fast, in high quality, and at affordable prices. We render certified translation services for basically any document that needs it. All our translations are 100% accepted by the United States Citizenship and Immigration Services or USCIS and any other agency or institution in the US that requires certified translations. A certified translation is necessary for validity of all documents presented and for the efficient and smooth processing of petitions or requests. USA Translate understands all these, that is why we only render certified translation services of the highest quality. Along with any other documents required by certain institutions like the USCIS. We will translate any of these documents and many more from any language into English fast, on budget and at the highest quality on the market. These documents mentioned above are mostly required by different bodies including the USCIS, other US State and Federal agencies, lawyers, businesses and corporations, academic institutions, and many more. In some cases, certified translations may even be required to be submitted with a notarization. At USA Translate, we can provide all these; both certified and notarized translation services. We’ve organized our work according to very precise procedures: we’ve computerized all of the repetitive tasks to provide speedy delivery and culturally accurate translations. That gives us much more time to control and improve our production process and more time to dedicate to clients and translators. Contact us right now and make use of our web based project management system to get a live quote and online word count for your documents, all for free! Our live chat is open 24/7 to answer all your questions and concerns. Try it now! How does the translation certification look like? It’s great that you asked! Actually, there are quite a few clients wanting to see a sample of our translation certification, probably just to make sure they are getting what they need. Fear not, our certificate of accuracy is being done according to the USCIS rules, and you can see a sample of our certification in the next image (just click it to see a larger one). As for the USCIS requirements, another rule states that the translation needs to look like the original. It needs to have the same layout and all graphics need to be there, like logos, stamps, etc. We keep that in mind as well, and if you decide to use our services, your translation will look like the original and you will get the certificate of accuracy too. All our translations are guaranteed to be accepted by any USCIS office. In every country certified translation services have different qualifications. Logic as every country has their own legal requirements. 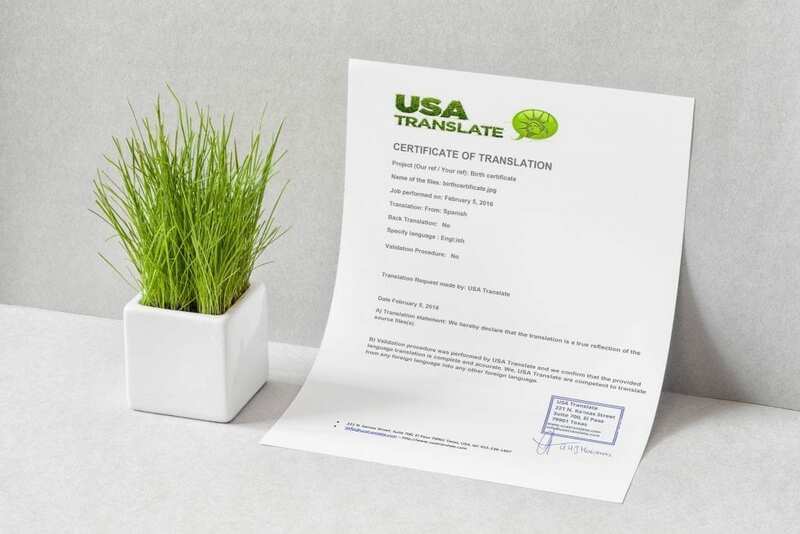 The certified translation process creates a legal binding recognized by U.S. officials, courts and academic institutions. In order to get an idea have a look at what does certified means. USA Translate uses only certified translators in order to provide the best services possible from and in over 80 languages. To be certified in a specific domain of activity in our case a professional certification refers to the endorsement of specific characteristics needed in order of being able to competently complete a job or task without the help of a third party and you can obtain this certification passing a test or exam. Need to have certified translation services for your personal documents fast and at the lowest price in Texas? Visit our office in El Paso, call us, send us an email or use our live-chat feature to chat with us directly at any time, we are open 24/7. By this time, you all know why certified translation services are important. But what’s even more crucial is that there are times in your life when your relatives or friends are in need for translation for immigration and they don’t know which the best place to acquire one is. So before you recommend us, you must get a decent understanding of a few elements. USA Translate has highly skilled professionals who can give you certified translations of all your documents. Being a certified member of ATA, we can provide accurate translations without any delay or added procedure. If your friends are in a rush, you can tell them that USA Translate will provide fast translation services within a day even. And if they get tense over rushed rates, tell them it’s a thing we don’t believe in and we do not charge extra for that. With affordability and quick service, we are just a click away. Our live chat option is the best way to approach us. We take care of all your inquiries and through our instant quotes, we are giving you a fair option to compare and choose the best prices for your project. Your translation needs are what we are here to oblige, so come to us with all your documents, certificates, papers and records and we’ll provide certified translations with credibility and care.